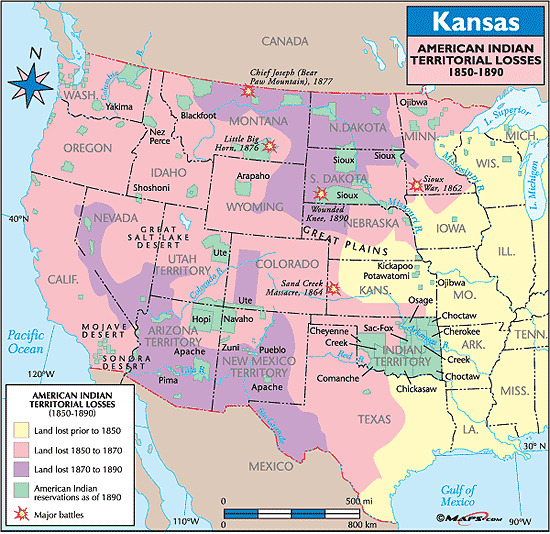 Between 1803 and 1861 the people and the institutions of the United States expanded into what is now Oklahoma (see Manifest Destiny). This phenomenon did not take place in isolation, nor was it a sequence of random events that were of little consequence to the basic sweep of national development. Instead, it was part of a much larger story that was programmed intentionally by eastern centers of power to meet predetermined objectives. The agents of expansion, consequently, usually found in Oklahoma what they were looking for exploitable natural resources, commercial opportunities, an agricultural paradise, a Great American Desert, a resettlement zone, and a military and administrative problem. 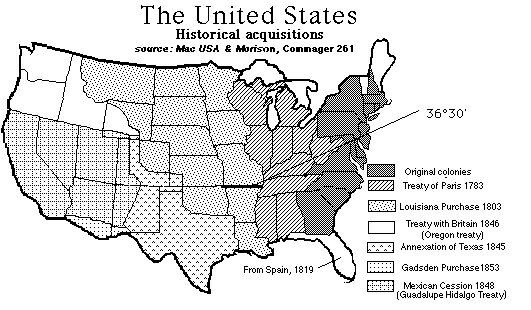 Oklahoma did not become part of the United States until 1803, when the new American republic acquired the Louisiana Purchase. The U.S. Congress divided the purchased domain into two territories: Orleans in the south and Louisiana in the north. The Territory of Louisiana included what is now Oklahoma and had its administrative center at St. Louis. In 1812, northern Louisiana became the Territory of Missouri; in 1819 southern Louisiana, including Oklahoma, was organized as the Territory of Arkansas. The territorial governors of Arkansas exercised administrative jurisdiction over Oklahoma for the next thirty years. President Thomas Jefferson believed that Louisiana was the stuff of empire. For the United States, it could provide needed natural resources, living room for an expanding population, a barrier against foreign aggression, opportunities for profitable commerce, and the space for the resettlement of eastern Indians. Jefferson recognized, however, that effective use of Louisiana's resources required better knowledge of its people, its topography, its flora and fauna, and its rocks and minerals. His desire for that kind of information caused him and his successors to dispatch a series of military expeditions to undertake scientific exploration of the province once it passed into the possession of the United States. Meriwether Lewis and William Clark commanded the earliest and the best known of these expeditions. Between 1804 and 1806 it gathered detailed information about the northern reaches of Louisiana, in addition to impressing the Indians about the power and might of the Great Father in Washington. What it had done in the north, Jefferson hoped that other expeditions would do in the south and southwest. In 1806 the president dispatched two of these. One, led by Capt. Richard Sparks, was to ascend Red River to the Wichita Villages and then go by horseback to the Rocky Mountains. The other, commanded by Capt. Zebulon M. Pike, was to search out the origins of Red River by going overland to the Rockies and then south to the river. Confronted early by units of Spanish cavalry, the Sparks expedition (also known as the Freeman-Custis expedition or Red River expedition) aborted without achieving any of its goals. The Pike expedition, however, was more successful and heralded important consequences for Oklahoma. In July 1806, Pike departed from St. Louis on a route that took him up the Missouri River to the Osage villages and then across Kansas to the Great Bend of the Arkansas River. At that point Lt. James B. Wilkinson and five men went east down the Arkansas, while Pike and the rest of his command continued west to the Rocky Mountains and south to an uncertain future in New Mexico. Wilkinson's route took him through Oklahoma during November and December, where water in the river, when not frozen, was barely deep enough to float dugout canoes. As brutal as the crossing had been, Wilkinson's report to the Jefferson administration contributed much to the knowledge base of southern Louisiana and of Oklahoma. He established that the Osage Indians were numerous and at war with intruder eastern tribes. He recorded that exploitable resources seemed abundant, for he had heard of lead mines and a salt-encrusted prairie. Wilkinson also made particular note of a seven-foot waterfall on the Arkansas River (Webber Falls). Nothing in Wilkinson's report intrigued government officials more than his reference to a salt prairie, which renewed interest in long-circulating rumors about a "salt mountain." In 1811, George C. Sibley, an Indian agent at Fort Osage, was finally able to confirm the reports when he visited the Great Salt Plains in Alfalfa County and the Big Salt Plain in Woods County. Impressed by the vast sheets of salt that glistened "like a brilliant field of snow" and by rocks of salt sixteen inches thick, Sibley reported that there was in northern Oklahoma an "inexhaustible store of ready made salt" just waiting to enter "into channels of commerce." An expedition eight years later, undertaken as a private enterprise by the noted English botanist Thomas Nuttall, substantiated the growing sense that Oklahoma was a place of natural wonder and economic promise. In the spring of 1819, Nuttall accompanied a military unit out of Fort Smith that followed the Poteau and Kiamichi rivers to Red River. "Nothing," he enthused, "could exceed the beauty of these plains" with their uncommon variety of flowers, which possessed "all the brilliancy of tropical productions." The image of Oklahoma as portrayed by Sibley and Nuttall was dramatically revised by reports published in the wake of a military expedition that crossed Oklahoma in the late summer 1820. Commanded by Maj. Stephen H. Long of the Corps of Topographical Engineers, its mission was to search out once and for all the sources of the Red and Arkansas rivers and to descend each to the Mississippi River. In June Long led his command west from Omaha to the Rocky Mountains and then south to the headwaters of the Arkansas River. There, as had Pike before him, he divided his column, sending Capt. John R. Bell and eleven men down the Arkansas while he continued south to the headwaters of the Red River. Like Wilkinson fourteen years earlier, Bell found the Arkansas route tough going. Only this time the problem was not cold but hot temperatures. Three soldiers deserted, taking with them the journals of zoologist Thomas Say. Bell and his remaining men were glad to reach Fort Smith on September 9, 1820. Based upon his memory rather than his notes, Say later published an account of the expedition that described the Arkansas River valley in unenthusiastic terms. In the meantime, Major Long continued southward from the Arkansas, looking for the headwaters of the Red River. His party also included a noted scientist, Edwin James. In due time, Long encountered a broad stream which he took to be the Red River. Although cognizant of abundant wildlife, botanist James was more impressed by the scorching, mid-August heat and the dry bed of what turned out to be the Canadian River. From his perspective, the entire region was little more than a "wide sandy desert" and should "forever remain the unmolested haunt of the native hunter, the bison, the prairie wolf and the marmot." Its only value to the nation was as a barrier to the "ruinous diffusion" of the American people. James and his superior, Major Long, reached Fort Smith on September 13, embarrassed that they had explored the wrong river but relieved that the "Great American Desert" was behind them. Although separated by one year only, the portraits of Oklahoma as presented by Nuttall and the military explorers were as different as night and day. One, painted in the spring, was hopeful and enthusiastic; the other, painted in late summer, was pessimistic and apathetic. Given their time and place, both observations were probably correct. At least for the next one hundred twenty years, however, the perception of the Long expedition prevailed in the national consciousness. Oklahoma was part of the Great American Desert twelve months a year, an image that eastern power brokers would use to shape its future. While some Americans traversed Oklahoma in the interest of scientific knowledge, others explored it in the interest of financial profit. Among the latter were the Chouteau brothers, Pierre and Auguste, as well as Joseph Bogy, who had established profitable fur trading houses in the Three Forks region (where the Verdigris and Neosho rivers enter the Arkansas River) at about the same time the United States acquired Louisiana. Over the next decade, they were joined by Nathaniel Pryor, George W. Brand, Henry Barbour, Tom Slover, Hugh Love, and A. P. Chouteau. Because of their commercial interests and activities, their collective knowledge of Oklahoma's resources and people made the "discoveries" of Pike and Wilkinson in 1807 and Long and Bell in 1819 old news. Hunters like Alexander McFarland, who operated out of Pecan Point on the Kiamichi River and entrepreneurs like Natchez-based Anthony Glass possessed similar knowledge regarding the Red River. In 1808, Glass spent most of the year with the Wichita Indians at their Twin Village site trading for horses and searching for a meteorite the tribe considered sacred. Following the negotiation of the Adams-Onís Treaty with Spain in 1819, the activities of the Three Forks and Red River traders foreshadowed an even greater commercial, natural, and strategic interest in Oklahoma. Among other things, the treaty set the southern and western boundary with Texas. Spain had hoped that a clearly defined border would assure its continued possession of Mexico, but its officials miscalculated. In 1821 the colony declared and won its independence. This unexpected development galvanized the Three Forks traders and merchants into extraordinary commercial activity. Assuming that new authorities in Mexico would welcome American manufactured goods in Santa Fe, something that Spanish colonial officials had not, two notable trading expeditions left Three Forks for New Mexico in 1821. One, led by Hugh Glenn and Jacob Fowler, was formed from residents of the Three Forks area; the other, led by Thomas James, was organized in St. Louis. Both carried trade goods for Mexican as well as Indian customers; both were prepared to trap for furs if the opportunity presented itself. On the way west, the two groups took different routes. The Glenn-Flower party followed the Arkansas River, while the James party followed the Cimarron River. With the former stopping near Pueblo, Colorado, to trade with the Indians and to trap for beaver, only the latter enjoyed a hearty welcome in Santa Fe. It was not the first American party, however, to set out goods in Market Square. That honor belonged to William Becknell of Franklin, Missouri, who arrived a few days earlier by following an overland trail that cut across the Panhandle of Oklahoma. Over the next thirty years, tens of thousands followed this Santa Fe Trail to New Mexico, including the noted Josiah Gregg. 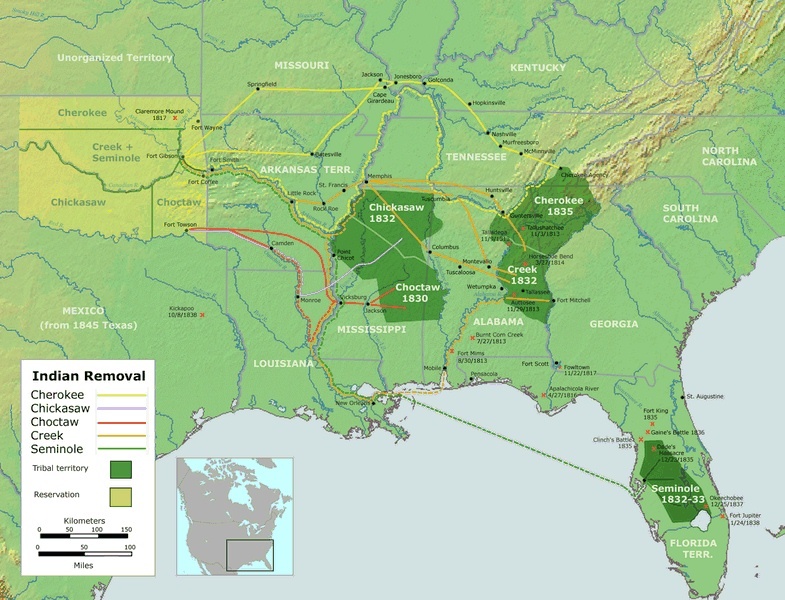 In purchasing Louisiana Territory, President Jefferson had envisioned it as an area suitable for the relocation of American Indian people east of the Mississippi River who declined to embrace the cultural and political sovereignty of the people and government of the United States. By 1820 this aspiration had become settled government policy, with removal first voluntary and then mandated (Indian Removal and Trail of Tears). Government officials very early selected Oklahoma, already identified in the national psyche as marginally useful for agriculture, as a suitable Indian Colonization Zone, or Indian Territory. No decision or event impacted Oklahoma more. Most obvious was that tens of thousands of tribal people poured into the region. Equally important was that the designation accelerated American expansion into Oklahoma. Not only did the population of tribal people increase, but so too did the number of individuals and groups who exchanged goods, provided services, and secured peace. These included commercial entrepreneurs like Holland Coffee, who opened a trading post on Cache Creek in 1836, and Abel Warren, who operated a trading house in Love County after 1837. It also included missionaries like Cyrus Byington, Cyrus Kingsbury, Robert Loughridge, William S. Robertson, Evan Jones, and Joseph S. Murrow, artists like John Mix Stanley, and writers like Victor Tixier. Above all, it included the U.S. Army. In Oklahoma, the principal role of the army was to keep the peace between resident tribes (the Osages, Wichitas, Apaches, Comanches, and Kiowas) and emigrant tribes (Cherokees, Choctaws, Chickasaws, Creeks, and Seminoles). Early on, the conflict between the two groups threatened to undermine the entire removal policy by discouraging eastern emigration. To institute and enforce a peace, the army first established Fort Smith on the Arkansas River (1817), Fort Gibson on the Neosho River (1824), and Fort Towson on the Red River (1824). As Indian removals accelerated during the presidency of Andrew Jackson, tension between the emigrant tribes and the resident tribes, especially the Plains tribes, increased. In 1834 the number of posts more than doubled, including Fort Coffee (on the Arkansas River), Camp Holmes (on the Canadian River), Camp Arbuckle (in Tulsa County), and Camp Washita (on the Washita River). The army seldom, if ever left one of these posts to do battle with a "hostile" tribe. At the same time, commanders often dispatched troops on reconnaissance missions designed to impress all tribal groups with the military muscle of the United States. In 1833 one such mission of Mounted Rangers out of Fort Gibson became world famous. It included the noted American writer Washington Irving and two prominent Europeans, Charles Latrobe and Count Albert-Alexandre de Pourtales, all three of whom wrote notable memoirs of the experience. The next year the Rangers and a new unit, the First U.S. Dragoon Regiment, participated in an even more remarkable mission, known as the Leavenworth-Dodge Expedition. Commanded by Gen. Henry Leavenworth and junior officers Henry Dodge, Nathan Boone, and Jefferson Davis, the five-hundred-man expedition hoped to facilitate a peace between the Osages and the Kiowas, Wichitas, and Comanches. The warfare between these four tribes had been a principal concern of the so-called Stokes Commission, appointed in 1832 by President Andrew Jackson to bring peace to Indian Territory. Riding some three hundred miles southwest of Fort Gibson to the Wichita villages and back, a journey documented ethnographically by artist George Catlin, the column met its strategic goals. Specifically, the Comanches and Wichitas signed treaties of peace and amity with the Stokes Commission at Camp Holmes (or Mason in Cleveland County) in 1835, and the Kiowas signed at Fort Gibson in 1837. But the mission exacted a huge price. Some 150 dragoons died in the Oklahoma heat, including General Leavenworth. While the army was facilitating the occupation of Oklahoma by tens of thousands of eastern Indians, it was also marking trails and building roads utilized by both Indians and non-Indians. Among the more important of these were local roads that connected the different forts. Some roads, however, had national significance. In April 1849, following the discovery of gold in California, Capt. Randolph B. Marcy with the help of a trusted Delaware guide, Black Beaver, marked a route west from Fort Smith along the south bank of the Canadian River. The next year they selected the site for Camp Arbuckle, commissioned to protect travelers along the road. Camp Arbuckle was relocated and renamed Fort Arbuckle in 1851. The road paralleled ones described a decade earlier (1839 and 1840) by the noted Santa Fe trader Josiah Gregg and by the 1845 expedition that Lt. James W. Abert had led eastward from Santa Fe. Marcy's return route through Texas and Indian Territory to Fort Smith was subsequently followed by thousands of argonauts going to the gold fields and became the route of the Butterfield Overland Mail. In 1853, Lt. Amiel Weeks Whipple, with artist Balduin Möllhausen in his command, traversed the same course along the 35th Parallel, reviewing it as a suitable corridor for an intercontinental railroad to California. The army also conducted new boundary and additional topographical surveys. In 1850 and 1851, for example, two different expeditions that included noted naturalist S.W. Woodhouse marked the boundary between the Creek and Cherokee Nations. In1852 Marcy systematically surveyed the sources of Red River, a goal set one-half century earlier by President Jefferson. By 1861, then, most of Jefferson's expectations for the Louisiana Purchase had been realized, at least in Oklahoma. Early official and unofficial exploring parties demonstrated that it was a land of natural beauty brimming with exploitable resources. Subsequent expeditions proved its value as a barrier to the diffusion of the American population and to the northward expansion of Spanish influence. Three Forks and Red River traders demonstrated that Oklahoma had commercial potential, especially in exchanges with the Osages, Wichitas, Comanches and Kiowas, but also as a gateway to Santa Fe and even California. The successful concentration of eastern Indians illustrated the appropriateness of Oklahoma as a resettlement zone for tribal people who did not welcome American hegemony. And the administrative and peacekeeping activities under taken by the U.S. Army proved that colonies like Indian Territory were expensive. In all of this, Oklahoma faithfully fulfilled the expectations of eastern centers of economic and political power, a pattern of cause and effect that shaped the course of the state's history then and now. The heart of the book, not surprisingly, covers the 19th century, lingering in detail over such well-known episodes as the Louisiana Purchase and William Seward's acquisition of Alaska. The final chapter looks at expansion in the 20th century. Kluger provocatively suggests that, compared with western European powers, the United States engaged in relatively little global colonization, because the closing of the western frontier sated America's expansionist hunger. Each chapter of this long, absorbing book is rewarding as Kluger meets the high standard set by his earlier work. Includes 10 detailed maps. The antagonism bubbles in two periods Stephanson examines closely, the 1840s and 1890s. In those times, the journalists, intellectuals, and presidents he quotes wrestled with America's purpose in fighting each decade's war, which added territory and peoples that somehow had to be reconciled with the predestined future. …A sophisticated analysis of American exceptionalism for ruminators on the country's purpose in the world. Recommended Reading: CAUSES OF THE CIVIL WAR: The Political, Cultural, Economic and Territorial Disputes Between the North and South. Description: While South Carolina’s preemptive strike on Fort Sumter and Lincoln's subsequent call to arms started the Civil War, South Carolina's secession and Lincoln's military actions were simply the last in a chain of events stretching as far back as 1619. Increasing moral conflicts and political debates over slavery-exacerbated by the inequities inherent between an established agricultural society and a growing industrial one-led to a fierce sectionalism which manifested itself through cultural, economic, political and territorial disputes. This historical study reduces sectionalism to its most fundamental form, examining the underlying source of this antagonistic climate. From protective tariffs to the expansionist agenda, it illustrates the ways in which the foremost issues of the time influenced relations between the North and the South. BIBLIOGRAPHY: Brad Agnew, Fort Gibson: Terminal on the Trail of Tears (Norman: University of Oklahoma Press, 1980). Ray Allen Billington and Martin Ridge, Westward Expansion: A History of the American Frontier (1949; rev. ed., Albuquerque: University of New Mexico Press, 2001). Grant Foreman, Pioneer Days in the Early Southwest (Cleveland, Ohio: The Arthur H. Clark Company, 1926). William H. Goetzmann, Army Exploration in the American West, 1803-1863 (New Haven, Conn.: Yale University Press, 1959). Josiah Gregg, Commerce of the Prairies, ed. by Max L. Moorhead (Norman: University of Oklahoma Press, 1954). Stan Hoig, Beyond the Frontier: Exploring the Indian Country (Norman: University of Oklahoma Press, 1998). Joseph A. Stout, Jr., ed., Frontier Adventurers: American Exploration in Oklahoma (Oklahoma City: Oklahoma Historical Society, 1976).